has come here to dwell. Which Side Are You On? tells the story of a song which was written in 1931 by Florence Reece in a rain of bullets. It has been sung by people fighting for their rights all over the world. Florence’s husband Sam was a coal miner in Kentucky. Many of the coal mines were owned by big companies, who kept wages low and spent as little money on safety as possible. Miners lived in company houses on company land and were paid in scrip, good only at the company store. The company owned the miners sure as sunrise. And that’s why they had to have a union. 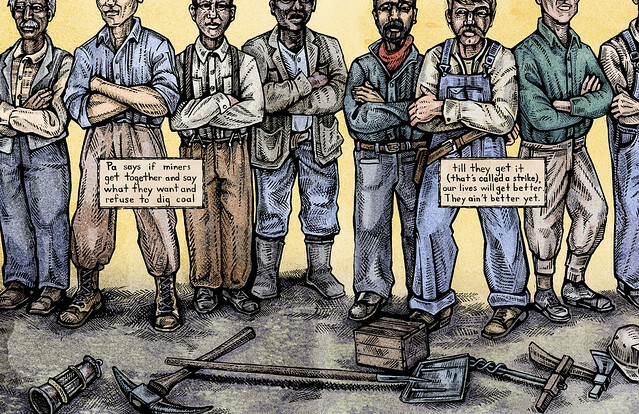 Miners went on strike until they could get better pay, safer working conditions, and health care. The company hired thugs to attack the organizers like Sam Reece. Writer George Ella Lyon tells this hair-raising story through the eyes of one of Florence’s daughters, a dry-witted pig-tailed gal, whose vantage point is from under the bed with her six brothers and sisters. The thugs’ bullets hit the thin doors and windows of the company house, the kids lying low wonder whether they’re going to make it out of this alive, wonder exactly if this strike will make their lives better or end them, but their mother keeps scribbling and singing. “We need a song,” she tells her kids. That’s not at all what they think they need. Graphic novelist Christopher Cardinale brings Florence’s triumphant story to life in true anarchist style. "The story is a good and important one, and it is well told for an elementary-school audience...Cardinale’s folksy, woodcut-style paintings include several memorable images." "It’s a high-stakes account of grace under pressure." "Cardinale's digitally colored scratchboard art is dynamic...Given that many of the same [labor] conditions exist today, only changed by mechanization, the music and lyrics included may well find use in the current generation. Lyon has given today's readers a stirring story." "Lyon and Cardinale make a perfect match for this picture-book homage to a 1931 rallying cry born under duress in Harlan County, Ky... Although this book describes a historical event, it can open a gateway to understanding terms such as "collective bargaining," what that right has meant, and to consider what it means today." "What a perfect time for this picture book’s arrival...“Which Side Are You On?" is an old song with new relevance for a generation facing a dubious future." "The story has real power and so do the best of the illustrations." "WHICH SIDE ARE YOU ON is beautiful, lyrical, and important, subtly showing us the importance of music and—even better—how anyone can make a difference, no matter their circumstances, as long as they put their heart and soul into it. A treasure." Watch Out for Clever Women!